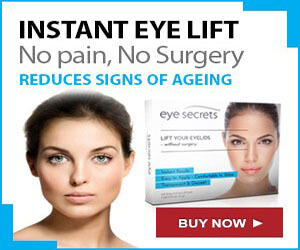 Eyes become the most attractive part of the face if you maintain them well. Yes, doesn’t matter what shape of eyes do you have but if you maintain and beautify them well with some makeup then it is quite appreciable. However, in this blog, you will know some makeup tips for hooded eyes that you can apply on if you have hooded eyes. You must be thinking what kind of hooded eyes are and how does it look like? Well, below you will first learn about hooded eyes and then you will look at some most appreciable eye makeup tips you can apply to your hooded eyes. Is your crease visible? If No, then you have hooded eyes, that means this post is just for you. Hurray! My sister has almond shaped eyes with beautiful eyelids and she rocks almost in any form of make-up. However, I have an hooded eye. Isn’t it boring? What Is A Hooded Eyes? Having hooded eyelids means your eyelids either are covered, by skin or bone which provide an appearance of heaviness. This sort of eyes is also called “bedroom eyes”. Just like the rest of your body, eyes also come in all shapes and sizes among it one of these variations is a hooded eye. Sometimes, the question may arise that “how do you know if you have a hooded eye”? Well, the answer is so simple. If you have hooded eyes or even semi hooded eyes then you will have excess skin folding down from brow bone to lash line that unclear your creases, shrinks your lids and make them look drowsy. But, when it comes to apply make up for hooded eyes, you cannot apply the same makeup as you do for almond-eye shape. 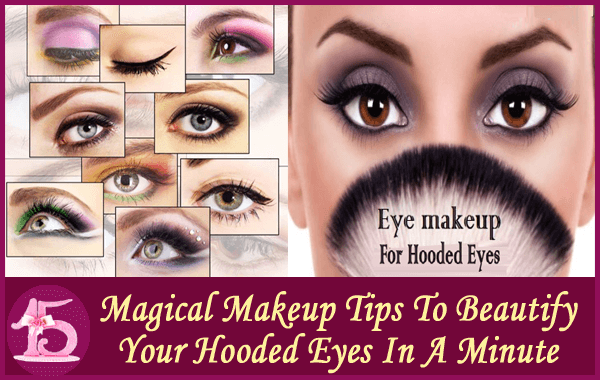 The best key to make your hooded eyes look stunning and amazing is to learn some hooded eyes makeup tutorial that makes them look wider and awake. Hmm! May be I sound like a commercial! But I’m just excited to share my experiment which worked! It is quite better to wear eye makeup with open eyes because it can be difficult to find out the natural crease with closed eyes. For hooded eyes or semi hooded eyes makeup, there is a need to apply the eye shadow just above where you have marked your crease as contrasting in the natural fold of your lid. This way the color won’t get lost when you open your eyes. 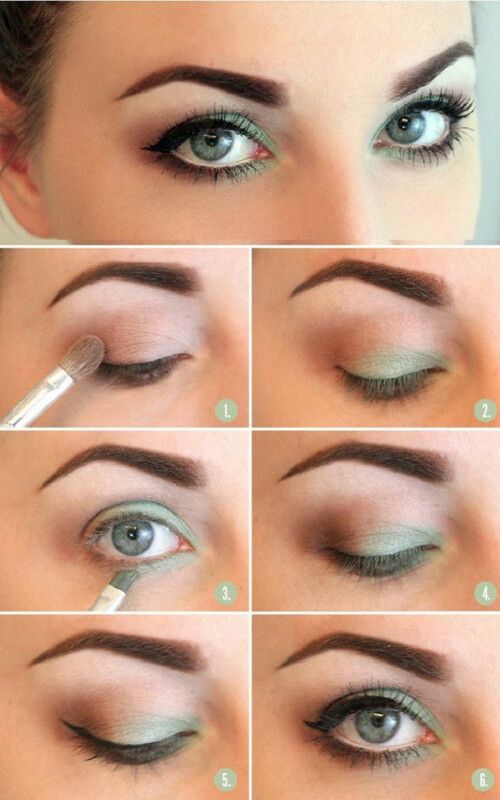 This tutorial is quite simple, as you got to use only little mat green shadow, in the inner part of your eye by leaving the crease untouched. 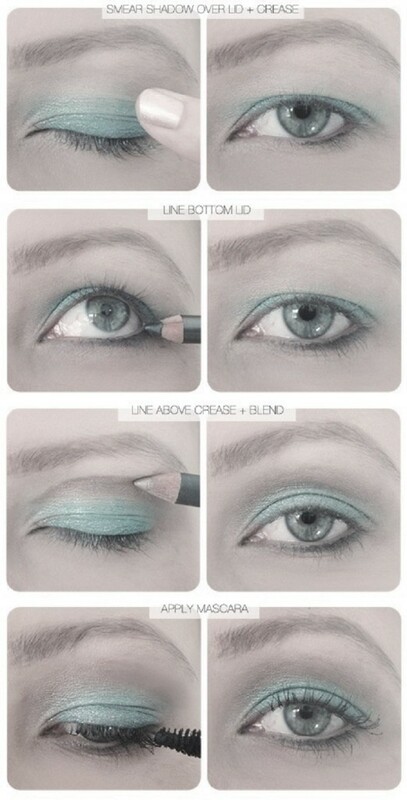 Whereas on the lower line add brown shadow, and blend it well to make more depth. 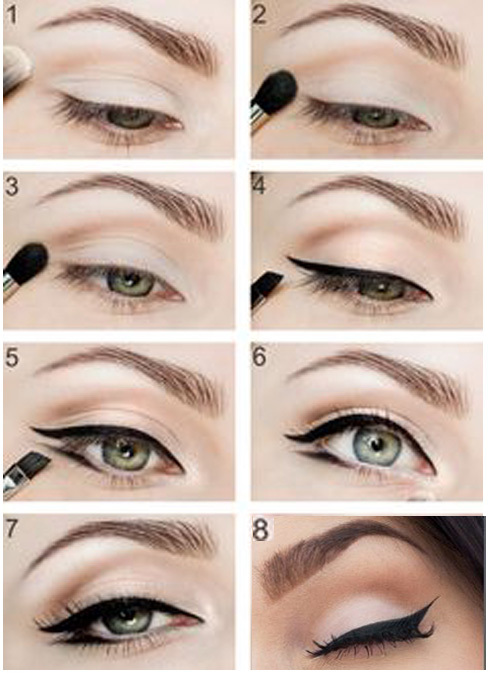 Now draw a thin line with eyeliner for hooded eyes and finish off with mascara. 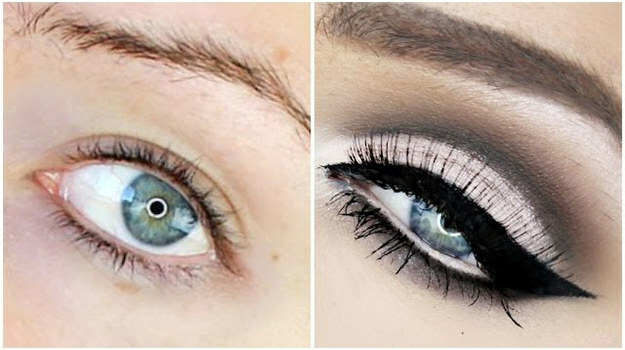 Cat eyes are simply adorable, and this tutorial you will learn how to get them without any liner. It is just like the magic, which the right amount of eye shadow can do. 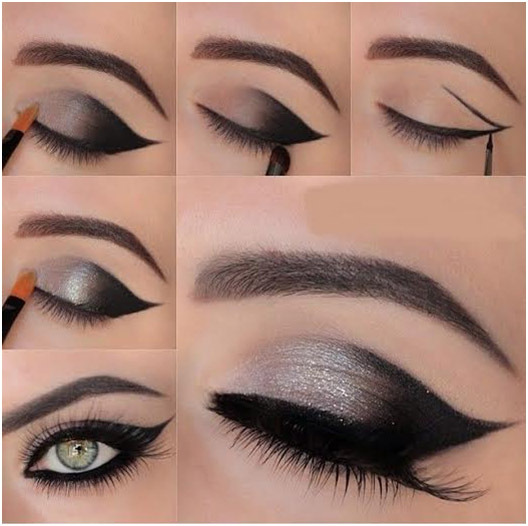 Follow the steps and get beautiful eye like this. 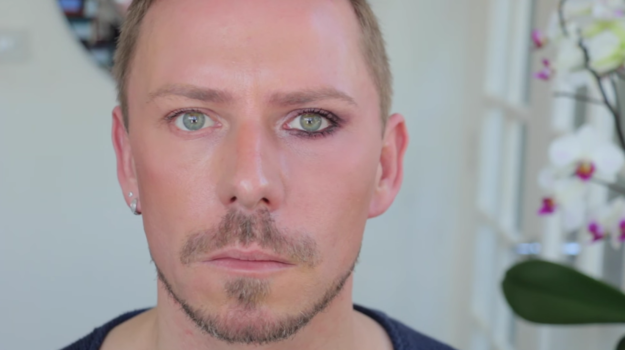 If you’re a beginner at applying eyeshadow then give a try to this foolproof straight-line technique. Take a handkerchief and place it on the outer corner of your nose to your eyebrow. 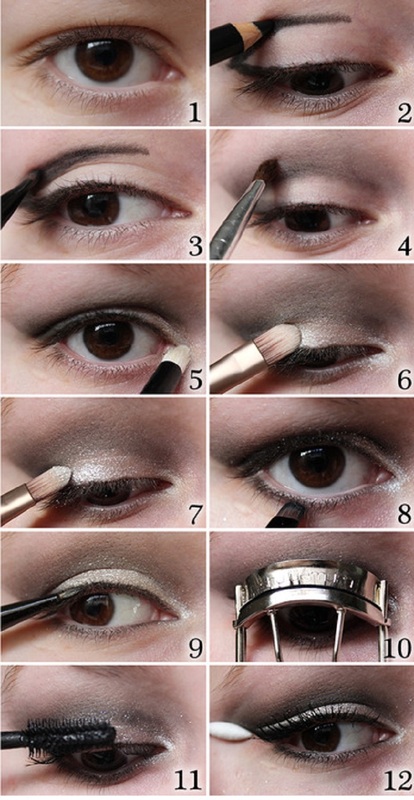 Now apply eyeshadow from the center of your eye straight out to the handkerchief. It’ll give hooded lids the illusion of lifted eyes. As your lashes are often touching the brow bone, so don’t use a mascara that will smudge. 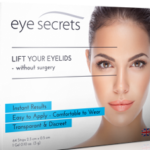 Moreover, long eyelashes open up hooded eyes in instant. Just use only one shimmery eyeshadow for hooded eyes to make it look more opened and defined. Now apply the plum gold shadow above your natural crease, and then define your eye with the eyeliner and mascara. 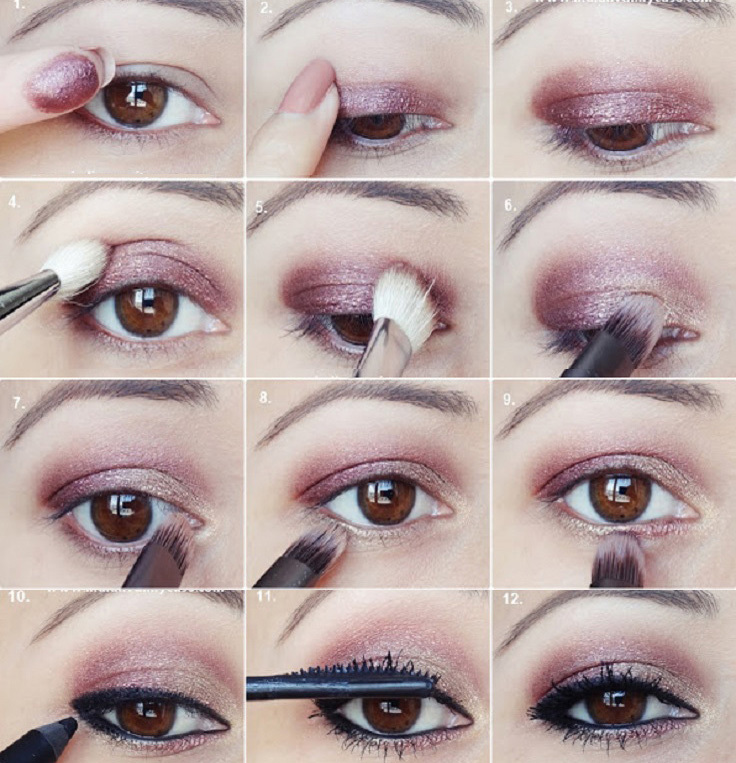 In this way, you can know how to apply eyeshadow for hooded eyes. Sparkle-lovers cheer: For most of the women, a shimmery shadow can be aging, but on hooded or semi hooded eyes, it got the opposite effect. Shiny eye makeup expresses the eye shape more by creating the illusion of light where there is generally darkness. This is the best example of no makeup look and amazing for a daytime look. Use the earth tones from your eye shadow palette, and get the subtle natural look. Emma Stone’s look fresh because of her simple eye makeup for hooded eyes. With her hooded eyes, which are wide already, less is more. Forgoing winged eyeliner and makeup on lower lash line enhances her eye shape without overwhelming it. Blend a shimmery champagne eyeshadow across the eyelid and up towards your brow bone, now take it into the inner corner of the eye. Take a bit along the inner third of your lower lash line to add more light. With this makeup tip, you will get to know how to properly use sparkles for your hooded or semi hooded eyes. Make use of beautiful green color, or whatever you like. It will look awesome for your parties and night makeup. If you are looking for the evening smoky eye, then here you have the suggestion. 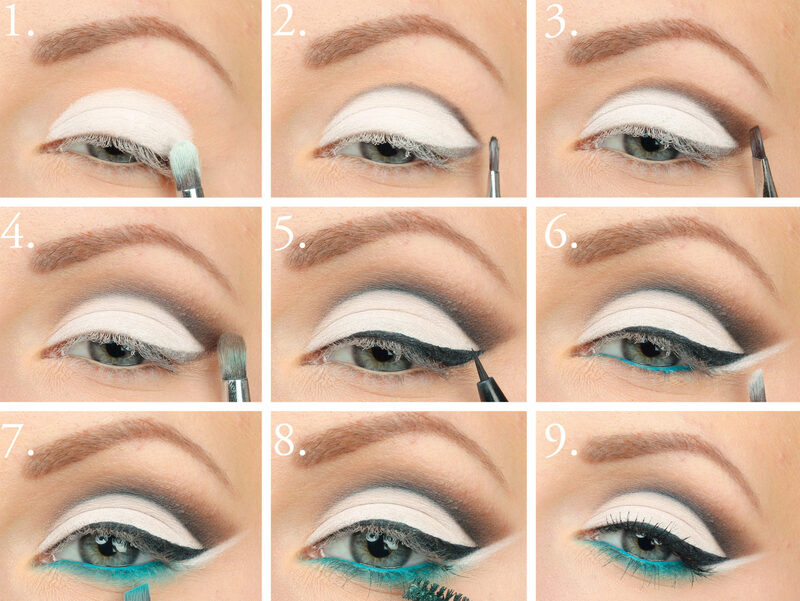 Just follow this step by step picture tutorial to get ready for going out! Select a bright color to bring your eyes to the surface. You can even skip the eyeliner and give your best with mascara. We all know that white eyeshadow does magic. But when it is combined with brown crease color then it provides a perfect combination for faking bigger and more opened eyes. This is the best and amazing trick, apply the mat brown eyeshadow, on your lid and above your crease, and get false lashes and place them on outer corners of your eyes. If you have hooded eyes then now you don’t have to worry at all because you will no longer go out of your home with hooded eyes. This is because you will now able to apply some easy to apply eye makeup tips for hooded eyes. Each of the eye makeup tips mentioned above is so easy to apply and they are so effective that will no longer let you show your hooded eyes. 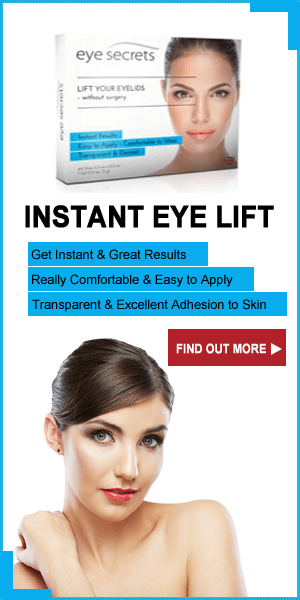 Now you will feel good when you will go out of your place with hooded eyes. Try these effective makeup tips for hooded eyes: Tip 1: wear eye makeup with open eyes, Tip 2: Apply the eyeshadow...Tip 3: Apply Green Shadow, Tip 4: Get Smoky Cat Eye...Tip 15: Brown Eye Shadow and Falsies. 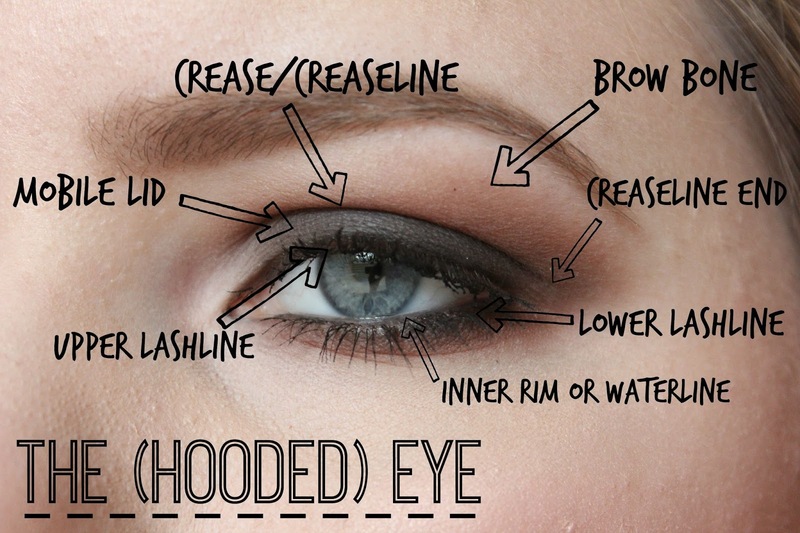 Try all these makeup tips to make your hooded eyes more attractive.